I was reading some stuff on pre-Celtic substrates in Gaelic and Celtic in general. I dound it very interesting how modest the number of substrate words are in Gaelic and how they collectively sound like key elements of the Mesolithic hunter-gatherer-fisher economy in Ireland including words for Salmon, herring, lobster, crab, winkle and Hare to name some Gaelic-specific words. Now to me the selection (I have chosen the more material words) of apparently pre-Celtic words specific to Gaelic and those in Celtic languages in general has an uncanny resemblance or at least strong compatibility with a pre-agriculture culture concerned with fishing, pre-farming animals, plants, water bodies etc. Even the Gaelic-only pre-Celtic words have an uncanny fit with the fishing-dominated Irish pre-farming economy (due to lack of large animals other than wild boards). If the above is representative of local words the Celts encountered on arrival in western Europe and then Ireland then this looks so very like what you would expect when farmers meet hunter-gatherer-fishers rather than when Copper Age people met farmers. Not saying that this is in any way clinching but it is food for thought. If these numbers actually represent historical people, then it would seem that the Mesolithic Hunter Gatherer was never overcome by later arrivals. How Y-DNA R1b came to dominate male lines can't be explained by this, though. If the above is representative of local words the Celts encountered on arrival in western Europe and then Ireland then this looks so very like what you would expect when farmers meet hunter-gatherer-fishers rather than when Copper Age people met farmers. I'm not sure what you're getting at. Are you saying you think Celtic came to Ireland with farmers? Why not bronze age ppl, who met people in Ireland that had a mesolithic way of life? Eurogenes did a Baltic Hunter Gatherer/Mediterranean Farmer/Anatolian Farmer type run which showed that the Baltic HunterGatherers were about60%plus inIreland. We don't know what's what, polako is guessing. Well, when the 60% plus score among Irish testers reaches a high in Lithuania, you can assume it doesn't represent the Mediterranean or Anatolia. Or, perhaps that would have been your guess. What I mean is that the mystery non-IE words in Gaelic of a material type almost all relate to classic fisher-gatherer things. If the Celts had met a group of farmers who had been there 1500 years at that point in time then you would not expect this meeting to only select what sounds like hunter-fisher type vocab. In fact it is known that the Neolithic people seriously turned their backs on this kind of and it was probably almost idealogical. The apparently non-IE vocab in Gaelic and indeed in Celtic as a whole sounds almost hand picked pen portrait of a pre-Neolithic economy and has almost nothing relating to farming in it. That makes little sense if the Celts met long established farmers. It makes a lot more sense if the Celts or IEs found a Mesolithic people on arrival. That would be more compatible with the model that IE arrived in the west with the first farmers there rather than later. I realise that there are many arguements that support the copper age model too but this just jumped out to me when I was reading about pre-Celtic substrates (I wasnt going looking for this and was genuinely surprised at the pattern). Just thought I would share it. One thing I would say about farming in the isles is it did arrive rather late as it also did in the northern European plain in general. The gap in time between this spread c. 4000BC and the period Kurgan models focus on is nothing like as great as the gap in time between the early farmers in SE Europe and the Kurgan period (1000s of years). Indeed, I have wondered for a while about the way cattle pastoralism spread into SE Europe from Anatolia c. 5000BC into the west shores of the Black Sea and was therefore able to spread with the rather late primary farming thrust into northern Europe. I wonder if this actually set this group apart from the primary farming wave into Europe 1-2000 years earlier associated with LBK and Cardial Ware. Indeed, this late northern first farmer group even after spreading c. 4000BC did retain secondary features in common which are suggestive that links were sustained among them for some centuries after and of course TRB (Funnel Beaker) was a very big network of farmers which spread from opposite SE England far to the east and into a zone which did have contacts far to the east through which ideas and words could have spread. Indeed it is well known that by at least 3500BC a TRB culture pot from southern Poland shows wagons and wheels were known. Can we really distinguise between a word that was among original PIE vocab and a word for an object that filtered through chains of TRB and similar late Neolithic networks? That is essentially why I remain on the fence about the whole PIE question. I think we can all agree that its unlikely that the first waves of farmers c. 7000-5500BC that swept Europe were IE peoples. However, the posing of a straight choice between them and Kurgan peoples c. 3-4000BC is oversimplifying the situation. It ignores evidence for further waves of ideas (and almost certainly people) that swept Europe and fall in between those two 'options' not least of which is the way cattle pastoralists seem to have entered SE Europe c. 5000BC with this pretty revolutionary new economic model sweeping fairly suddenly c. 4000BC from Poland to the isles with the spread of farming into northern Europe. It is also ignoring that huge networks like Funnel Beaker stretched from the Carpathians to the English Channel and ideas and words could have travelled easily through this huge network c. 4000-3200BC, including the concept and word for the wheel which was clearly known in TRB c. 3500BC. So, all I am saying is the first farmers c. 8-9000 years ago vs the Kurgan options of 5-6000 years ago and the 2-4000 year gap between them is a linguistic straw man arguement. Some huge things happened in the intervening period. Myles that is very interesting about the 60% baltic hunters in Ireland. Do you have a link to the page? This would of course be in line with the pre-DNA analysis of physical anthropologist who claimed that the Irish (among many others in Europe) had a big pre-Neolithic element genetically. The Irish Population is IE, and you can see the results for many other European countries. That was very interesting (although the abbreviations are tricky). The Basques really stand out for their very high Med. farmer input. They actually have low hunter input, very low Anatolian etc. They simply have far more of the Med. farm element than anyone else in this list including other Spanish, French and Italians if I am reading this right. If anything sets the Basques apart it is this. The simplest interpretation of this is the Basques represent some sort of relatively undiluted Neolithic farmer element rather than a hunter gatherer survival as once was common to claim. The real hunter gatherer survival zone of Europe would appear to be northern Europe where this element is far stronger than amongst the Basques. Given that R1b does not make the Basques distinctive but their autosomal DNA does seem to, it is tempting to see the reason for their language as somehow linked to their unusual autosomal genes rather than the ubiquitous R1b dominanted yDNA which does not set them apart. The fact that the Basques show no Anatolian Farmer is what really makes them stand out. In other runs this is shown as West Asian or Caucasus and I think that is more accurate. It would fit great for the lack of an Indo-European Language in the Basque Country except that the Basques are highly R1b. So, either R1b is not as connected with Indo-European as people think, or it came later. Also, on other Eurogenes runs this Mediterranean Farmer is broken up as West Med and Atlantic Med and the West Asian/Caucasus is separate. The areas along the Danube usually show high Caucasus/West Asian scores which is a route for the Neolithic Farmers, isn't it? It seems like they went up the Rhine but not down to the Basque Country. All the varying terminology is confusing. I have a suspicion (not based on much admittedly) that the Atlantic-Med. component used as disrinct from Baltic in some runs contains two elements - a pre-Neolithic western hunter-gatherer element and the Neolithic farmer element. Regarding the Basques though, they really stand out as Med. farmers on that table. Very few areas come close to their level of that element. In fact they seem to be the European peak of that element which is a little odd considering it is being described as Med. farmer which is normally thought to be of some sort of eastern origin. There has always been some suspicion that the Cardial culture hoovered up locals as it spread along the Med. So I just wonder if some of this Med. farmer component is really derived from the original farmers. Same feeling I get about the Atlantic-Med. component. The Atlantic-Med components strong areas actually seem to cut across two distinct zones of farmer cultures - the Cardial and also the more northerly zones which did not have any cardial imput at all (no Cardial has been found north of the Loire). So, I have real trouble in seeing this component (or in the Med. farmer guise of the table you linked to) as being a single farmer migration. It doesnt really fit. I sort of expect at some point pre-farming elements with an Atlantic-Med. element will be found and maybe some day this will be split into Atlantic pre-farming (which could be argued for in terms of the way the Magdallenian hunters expanded from Franco-Iberian area at the end of the ice age) and Med. farmer sections. These Magdallenian hunters may have not been identical to the Baltic ones. I think I read for example that some H mtDNA was found in some western pre-farming ancient bones although I do recall its validity was jumped on. If it was real then this would be evidence that we should not assume that Baltic Hunters were identical to western hunters. So maybe after all the Basques element may yet turn out to not be so Med. farmer as it seems on that table. I think the science of autosomal clusters has a good bit of refining to be done. Some very interesting posts. I think the naming of the clusters should be taken with caution and not at face value as well though - The situation of the Basques seems to be a very confusing one but hopefully it will clarify more as time goes on. It would be really interesting if they were a quite well preserved Neolithic group...And i suppose Y-DNA haplogroups don't stay the same over thousands of years, a slight advantage in the short term might not make much of a distribution but over thousands of years their Y-DNA could theoretically look quite different. I don't know how exactly that would be evidenced if it did take place, though. The so called Baltic-Hunter Gatherer component is nothing more than the so called North-European component which is modal in Lithuanians, in any case Spanish Basques are about ~2/3 of the so called Mediterranean Farmer component and 1/3 of the Baltic-Hunter Gatherers component, the French Basques are from 26-33% Baltic-Hunter Gatherers, and from 65-72% Mediterranean Farmer. However as I said the labels are arbitrary, and the Farmer or Hunter Gatherer affinity of it is far from certain. The Braña samples(The only true Mesolithic samples) show 71.5% North European and 24.8% Mediterranean, the Neolithic Hunter Gatherers Avj72 shows 79.1% North European and 10.3% Mediterranean, whereas the Neolithic Hunter Gatherers Avj70 shows 85.8% North European and 5.8% Mediterranean, on the other hand the Neolithic Farmer Gok4 shows 28.1% North European and 64.2% Mediterranean, but also a 5.6% Southwest Asian, Neolithic Farmer Oetzi shows 13.6% North European and 59.5% Mediterranean, but also a 15.9% Southwest Asian and 6% West Asian. The West Asian component is only present in Oetzi, but the presence of the Southwest Asian component is what truly differentiates the Farmers from the Hunter Gatherers be them Neolithic(Swedish Avj) or Mesolithic(Braña). The French Basques_Li.et.al(HDGP)(n=23) are 59.5% Mediterranean, and 39% North European, they have other minority components such as 1.1% South Asian, 0.2% West Asian and 0.1% Amerindian, but these are well in the noise range. The Spanish Basques_Pais_Vasco_1KG(n=7) are 56.1% Mediterranean, and 41% North European, they have other minority components such as 1.1% South Asian, 1.5% West Asian and 0.3% Amerindian, but these are well in the noise range. Now the interesting part about the Basques relative to other Europeans is that they are greatly lacking on the West Asian department, only the Finnish_D(n=15) and FIN30(n=27) population has a lower West Asian score at 0%, however they both have Southwest Asian ranging from 4.7 to 4.8%. Interestingly Southwest Asian is 0% in French and Spanish Basques, but also in Orkney_1KG(n=21), Orcadian_HDGP(n=13), British_Isles_D(n=8), Irish_D(n=17), Argyll_1KG(n=4), it is found at noise frequency of 0.1% in Cornwall_1KG(n=27), at 0.3% in English_D(n=11), 0.4% in Norwegian_D(n=10), 0.5% in British_D(n=12), and 0.7% in Kent_1KG(n=36). What I observe is that the areas where R1b-M269+I-M170 predominates, namely Ireland, Cornwall, the Basques, the Southwest Asian component is absent, the exception to this would be the Norwegians. 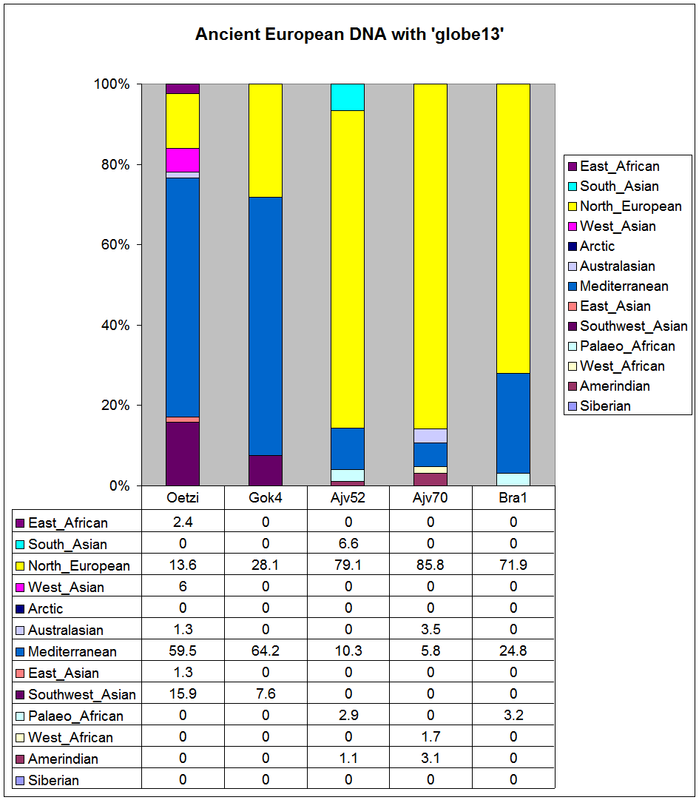 In any case, interestingly enough it is the Southwest Asian component the one that is common in both Neolithic farmers Gok4 and Oetzi, yet lacking in both the Swedish HG and the Mesolithic Iberian Hunter Gatherers. Among all the Celtic peoples the tie of kindred was the strongest and most enduring of all their early institutions. (2) the unfree, or subject populations, known variously as taeg, aillt, alltud. The free tribesmen are exclusively those who claim blood relationship, and are members of the cenedl ('kindred group'). The unfree class of whatever origin were not included among the tribesmen, and were not subject to the rights and responsibilities of the cenedl. In general they carried on the agricultural work of the community. Below these were the class of slaves, the actual property of their owners, to whom a large part of the manual labour fell (Celtic Britain, by Nora Chadwick, p. 83) . . .
All counted their chief wealth in cattle. In Wales their seasonal nomadism is enshrined in their place-names, such as the very common hafod and hafoty, the 'summer hill pasture' and 'summer dairy' and its ty, 'dwelling', 'cot' (Ibid, p. 90). So, I'm thinking "the dominant class, presumably descended from the conquering Cymric (Celtic) population" was predominantly L21. The subject classes were something else and contributed the substrate that is the topic of this thread. I looked for items that indicated any kind of Mediterranean bias. I couldn't find any. Is there a similar list of non-IE words common between Proto-Celtic and Proto-Italic? I'm just looking for some geographical bias in these unique word sets. Of course, just something that stood out to me as fly fishing is a hobby of mine. Gearóid Mac Eoin proposes the following words as deriving from the substrate- Bréife 'ring, loop', Cufar, Cuifre/Cuipre 'kindness', Fafall/Fubhal, Lufe 'feminine', Slife, Strophais 'straw'; and the following placenames- Bréifne, Crufait, Dún Gaifi, Faffand, Grafand, Grafrenn, Life/Mag Liphi, Máfat. Peter Schrijver submits the following words as deriving from the substrate: partán 'crab', Partraige (ethnonym), (partaing > Lat. parthicus), pattu 'hare', petta 'hare', pell 'horse', pít 'portion of food', pluc '(round) mass', prapp 'rapid', gliomach 'lobster', faochán 'periwinkle', ciotóg 'left hand', bradán 'salmon', scadán 'herring'. In a further study he gives counter-arguments against some criticisms by Graham Isaac. Many of these words could be pre-Neolithic. One word that stands out as different and clearly much later is the apparently non-IE word for war chariot in Celtic. That is interesting. m. (British origin, see Ped. i 511 ) orig. n-st., Ped. ii 110 , cf. patnide and pattan, PH 6542 , possibly gp. of this word (see patán). A hare: lornan .i. patu, Goid. 77.125 . patu, Corm. p. 35 = pato, Corm. Y 1045 . pata .i. miol moighe no geirrfhiadh, O'Cl. pl. maoarbaais [= marbais] .iii. pait, Ériu vii 242.4 (B. na f.). ag fiadhach . . . ar paitib primluatha, ZCP vi 54.8 . Ériu v 146.21 . ?Indo-European *̂kṛ- (zero-grade of *̂ker- ‘run’), or IE *ker- 'turn', + -p/b/bh-, or else non-IE, + -ant- (participial, see -and) > Early Celtic *carbanto- > British, Gaulish *carbanto- (cf Modern Welsh cerbyd); Old Irish carpat > Irish, Gaelic carbad, Manx carbyd; adopted as Latin carpentum ‘a two-wheeled carriage’, and possibly cf Latin carpīnus ‘hornbeam’ (used for chariot-shafts and axles because of its strength, but for a different derivation see OIPrIE §10.1 p161). ?cf Middle Welsh carr, Old Breton carr, Old Irish carr, all 'a cart, a chariot'. Of course the interesting word is that the word Car in english derives from Gaulish Karros (via Latin Carrus and then middle-French). The cognate word in Irish language is Carr which was of course used to describe "horse and car" long before Henry Ford decided to get into automobile business. I suppose this is a good as place as any to ask; what was the iron language? Was it just an older version of gaelic or was it p celtic? Some have argued it was a p-celtic language! Page created in 0.173 seconds with 18 queries.